On 25 and 26 March, I made a short visit to Kyoto, a city home to many atmospheric gardens, traditional teahouses, Buddhist temples, and Shinto shrines of wondrous ambience and architectural beauty. Behind the seemingly similar designs of the temples and shrines are a diverse constellation of Buddhist and Shinto religious practices. Kyoto was initially unfamiliar to me. My office mate Mr. Tony Chui, a PhD student at the Centre of Buddhist Studies at HKU (who also frequently visits to Kobe, Kyoto and Nara) strongly recommended that I should not miss Kyoto during my visit to Japan. He reminded me a few days before I left for Japan by emphasizing that Kyoto is unique for its architecture, beautiful shrines and temples, and cherry blossoms. Acting on his suggestion, around one month before I confirmed my visit to Kyoto with my friends, Nayon and Sujan. They went to Kobe from Tokyo to take me to Kyoto on 24 March. In the morning of 25 March, we made our way to the Kinkaku-ji or Temple of the Golden Pavilion, one of the most visited Buddhist temples in Japan, which is located in Kyoto. Although I was somewhat aware of the importance of that temple, I had not expected its architecture to be quite so beautiful. It is a Zen Buddhist temple designated as a National Special Historic Site and a National Special Landscape, and one of 17 locations making up the Historic Monuments of Ancient Kyoto, and also a UNESCO World Heritage Site. I was drawn to several remarkable structures within the complex. One of them is a three-stored high Shariden, commonly known as the Golden Pavilion, which houses relics of the Buddha. The top two stories of the pavilion are covered with pure gold leaf, which reflects sunlight on bright days. As we had little time, we concluded our visit and headed off to Nara. As we spent the rest of the day in Nara, we missed out on Fushimi Inari Taisha, a Shinto shrine in Kyoto, which we wanted to visit. The next day, we went to visit the cherry blossoms. As we had so little time we planned to visit the Kiyomizu-dera, a Buddhist temple, which is also a part of the Historic Monuments of Ancient Kyoto, and UNESCO World Heritage site. Kiyomizu-dera is on a hillside and offers impressive views of Kyoto. Our last stop was Ginkaku-ji, also known as the Temple of the Silver Pavilion, a Zen temple located on the eastern hills of Kyoto. Ginkaku-ji is the second-most famous temple after Kinkaku-ji in Kyoto, which features wooded grounds covered with a many species of moss. The grounds consist of bamboo groves and dry-sand gardens. The structures are relatively simple but full of religious and aesthetic symbolism. 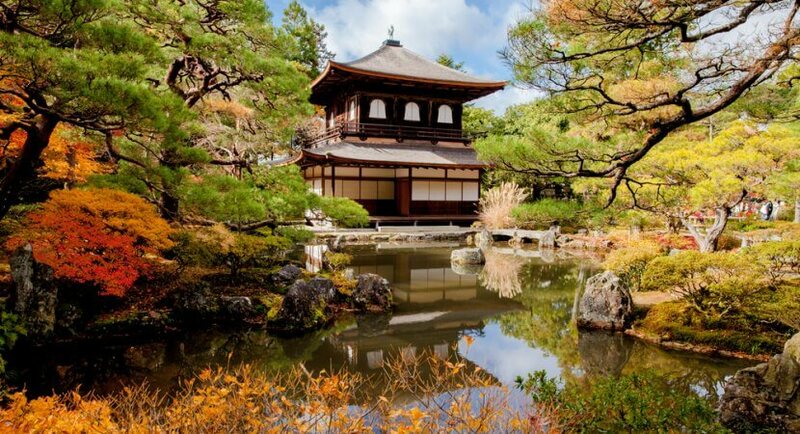 Ginkaku-ji was established in 1481 by the shogun Ahikaga Yoshimasa, who wanted a place to retreat from the disturbance of a civil war. After Yoshimasa’s death, the retreat was converted into a temple. The current grounds include meticulously gathered cones of white sand, and tall pines and a pond in front of the temple. A zigzag path also leads up the mountainside. Even though the place was crowded, I felt calm and inspired by the ambience of the temple, enabling me to reflect on the Buddha’s teachings. There are many other monuments in Kyoto, but due to our tight schedule we could not visit them. It was unfortunate that I had to leave Ginkaku-ji earlier than I would have preferred, as well. After being dropped off at Kyoto Rail Station, with my final destination being Kansai International Airport and Hong Kong, I decided that Kyoto had become one of my favourite destinations in Japan. I hope to go again when I will get a chance to learn more about this culturally and spiritually rich country.